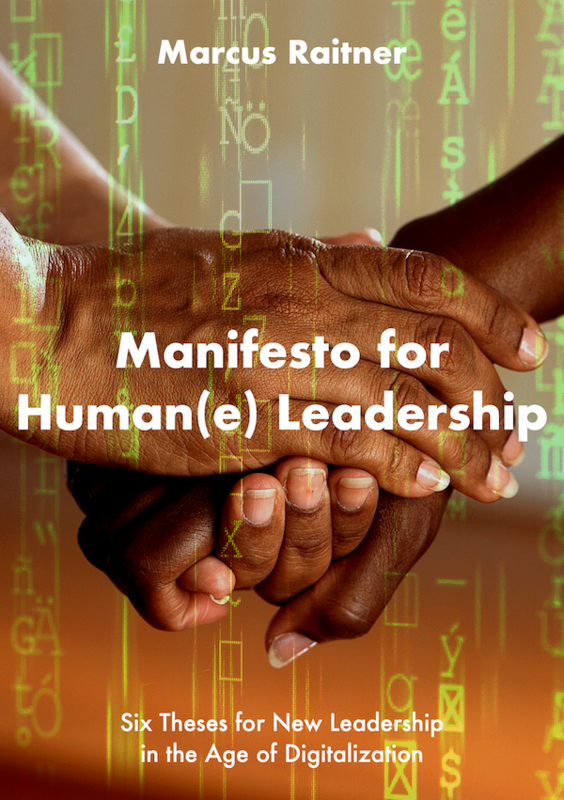 The Manifesto for Human(e) Leadership is on the one hand a useful stimulus for personal reflection on one’s own leadership qualities, especially in the form of the recently published e-book. On the other hand, its theses also provide a useful framework for an interactive workshop in which leaders can reflect and discuss those theses and their respective stances. Exclusively for my readers I offer for free this brand-new workshop format. One does not manage people—the task is to lead people. 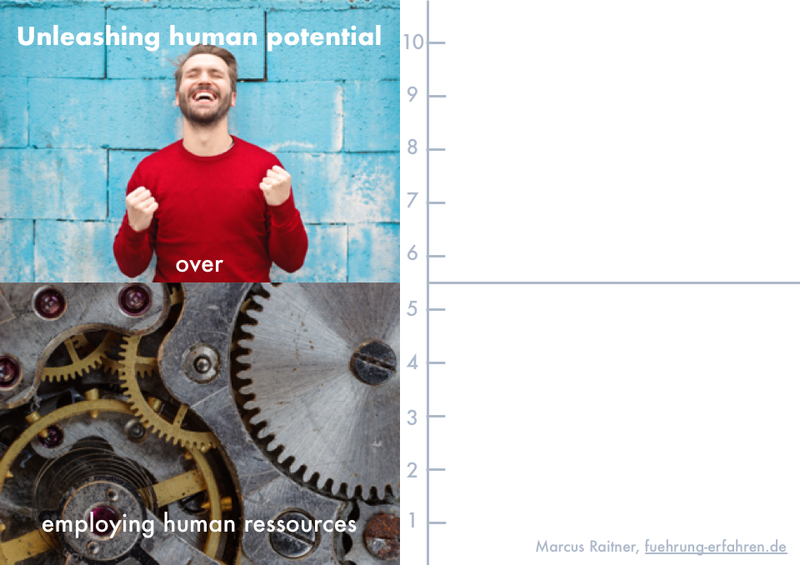 And the goal is to make productive the specific strengths and knowledge of each individual. Six movable walls or similar are required, on which the six theses of the Manifesto (in DIN A1 size) can be attached. Adhesive dots and sticky notes in two colors (green / yellow) serve as further working materials. 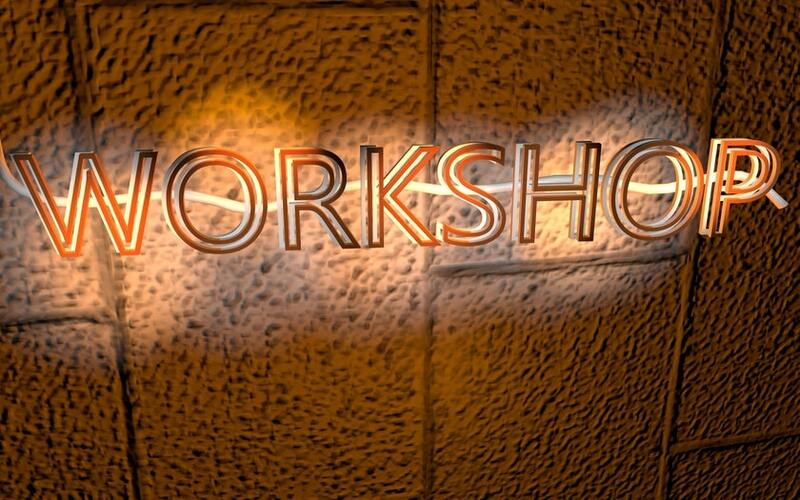 The workshop lasts about three hours. In its simplest form, the workshop is aimed at a group of up to seven people. 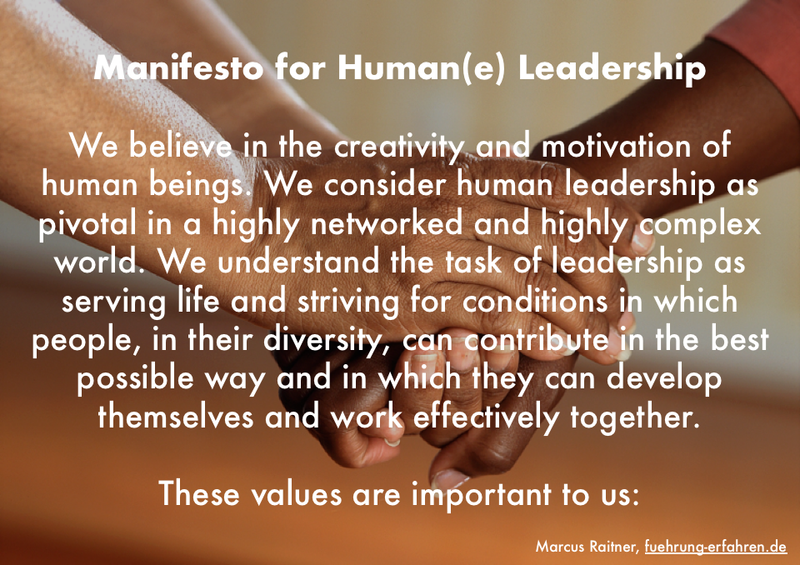 The workshop starts with the preamble of the Manifesto for Human(e) Leadership (and preferably the reference to the e-book). The group then proceeds to the first thesis. There each person receives an adhesive dot and sticky notes in two colors (green and yellow). First, each person silently reflects on the thesis and determines where he or she sees himself or herself on a scale of 1 to 10. In addition, each person writes on the green sticky notes what has brought them to this level (practices, methods, books, coaching, etc.). On the yellow notes each person writes down what is missing or what they could do to get one step further up. It is explicitly not about what is missing for a 10, but only about the next tangible step. After this phase of reflection, the people introduce each other to their positioning and explain what brought them there (green notes) and what could move them one step further (yellow notes). This should take a maximum of five minutes per person. As with brainstorming, only questions of understanding are allowed. It is not about right or wrong or about a ranking, but about seeing what is already there and which steps could be taken next. The group then switches to the next thesis and repeats the procedure there. The workshop ends after the sixth thesis with a short feedback round where each person describes the most important insight (“What have I learned today?”). The workshop can also be conducted in parallel with up to six groups. The room must then be large enough so that the six groups can discuss in parallel without disturbing each other. When the groups move on to the next thesis, a facilitator can either replace the poster of the previous group with a new one or briefly summarize the results of the previous group like in a World Café.